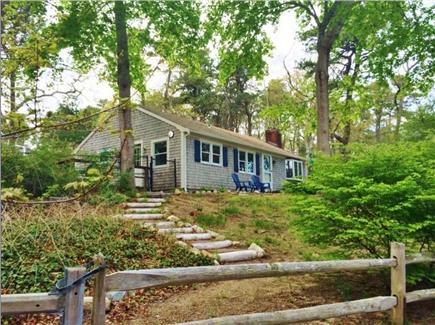 Relax and unwind at this inviting residence that is only a 5 minute walk from freshwater Bucks Pond, one of Cape Cod’s nicest private beaches in the Great Sand Lakes neighborhood. 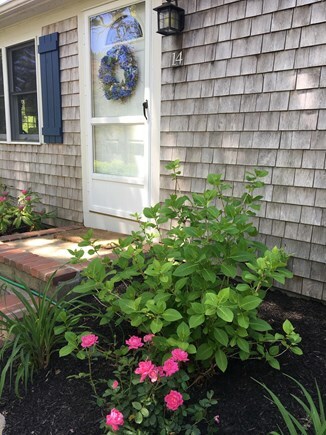 Enjoy your morning coffee on the deck overlooking one of the Cape’s many kettle ponds, or, after a full day of swimming, sunning, and kayaking, take an outdoor shower and grill a few burgers on the new bar-b-que! And if the summer temperatures get too hot for you, you can enjoy the cool comfort of central air conditioning as you unwind with a good book, watch cable TV, or select one of the numerous DVDs to enjoy. 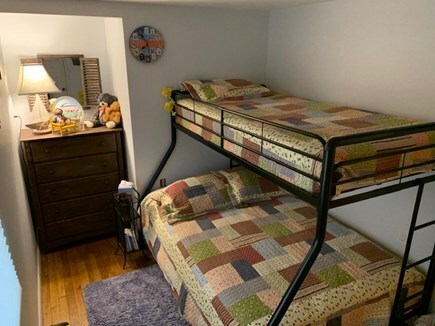 The house includes a spacious living room with a queen-sized sofa bed plus loveseat and couch; three bedrooms – a queen bed, a bunk set with a full and twin bed, and two twin beds; a modern kitchen, and 2 full bathrooms. 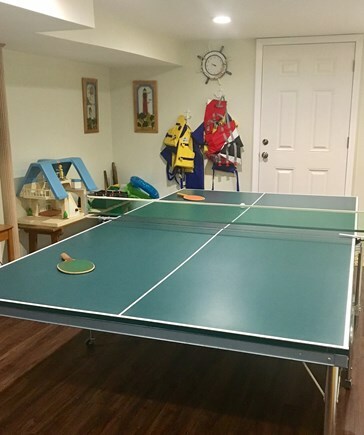 The basement houses a washer and dryer along with a ping pong table. 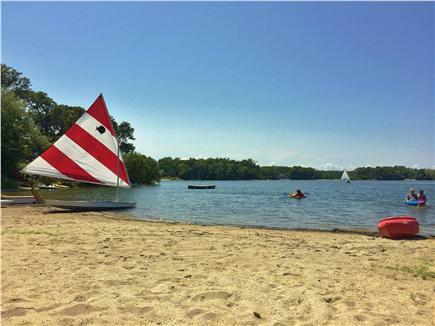 There are also beach chairs and a beach umbrella, life jackets, and beach toys with a convenient beach cart to help you bring what you need down to the lake. Our two kayaks can be found down at Bucks Pond ready for you to take a spin. 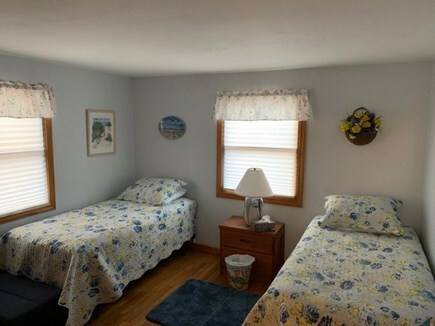 The central location of this house makes it so easy to take advantage of everything the Cape has to offer – just 3 miles to spectacular Red River Beach; 1 ½ miles to Brooks Park which has 4 tennis courts, a basketball court, and a terrific playground for the kids. 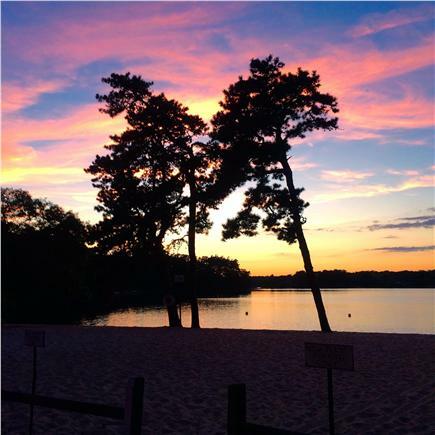 Thompson Field Nature Preserve, a delightful sanctuary for hiking and walking, is only ½ a mile away, and the Cape’s famous bike path is available at both Brooks Park and Thompsons Preserve. If golfing is your favorite pastime, the Cranberry Valley Golf Course, an 18 hole course, is only a 5 minute drive away. In addition, Harwich’s local shopping center that includes a Super Stop N Shop, for all of your grocery needs, as well as a CVS pharmacy, and several good quality restaurants, is less than 2 miles away. Additional pricing info: Please contact for monthly rental discount, State and local taxes of 12.45% will apply. This property has everything! Comfortable living spaces, cozy bedrooms, squeaky clean and neat, beautifully decorated and maintained throughout. I loved the proximity to sandy lake -- great for kids -- and a stone's throw to shops and restaurants and crashing surf of gorgeous beaches, too. I especially loved the quiet setting, great for R&R, and the cute deck for barbecuing. Look no further -- you won't be disappointed. My only regret was too short a time there...I'll be back! We were blown over with a feather! What a lovely, well appointed home. 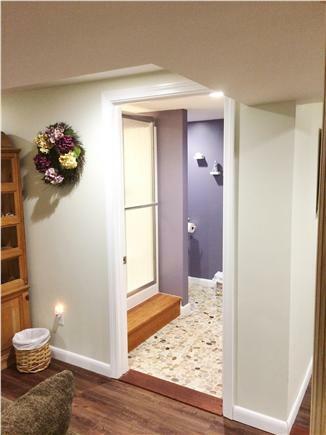 Beautiful new kitchen, cozy working fireplace, peaceful deck and fully finished basement perfect for kids hangout! Everything in the home is clean and inviting and the location is convenient to shops, dining and private lake. Incredible bang for the buck! Looking forward to our stay next fall! We enjoyed a lovely long weekend at this Cape home overlooking a small pond. The house is in a family neighborhood, with many nature trails, and the area is filled with natural beauty. 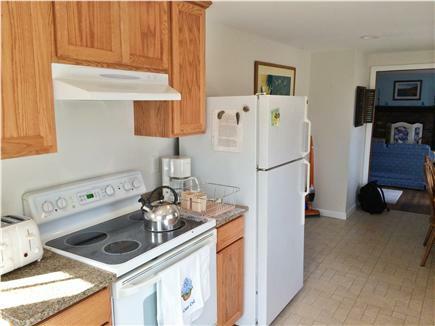 Pristine, adorable house in a great location. Spacious, finely appointed, comfortable home. Every possible guest need is provided. Enjoyed early-morning coffee on the deck with birds and chipmunks. 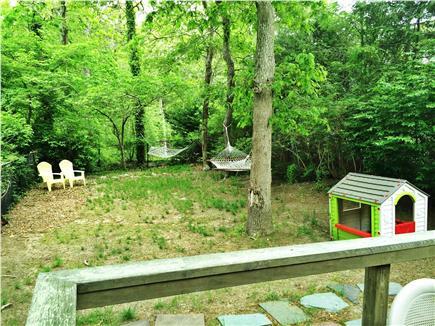 Located on quiet road, and nearby private pond is paradise. Easy access to all Cape destinations. You won't find a better value on the Cape. Can't wait to book for next year! It has all the comforts of home! I found it to be a great vacation spot with all the comforts of home. The house itself was so cute. It was a short walk to a beautiful beach and we had a great time in the kayak. The neighborhood was nice and quiet, and it was great to get away from the stresses of everyday life.